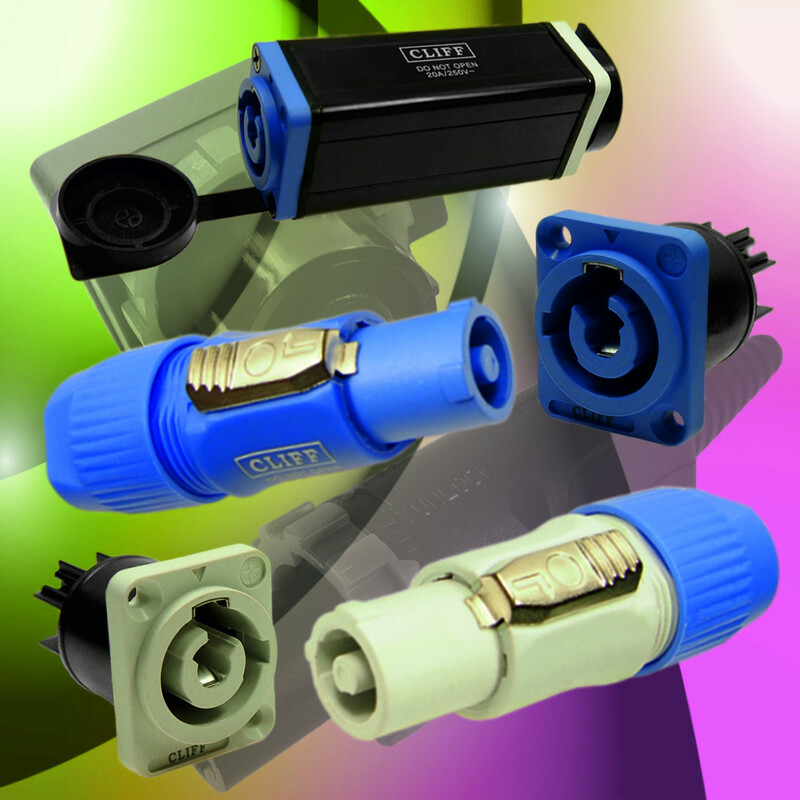 Cliff™ adds locking power connectors to the CliffCon® range. 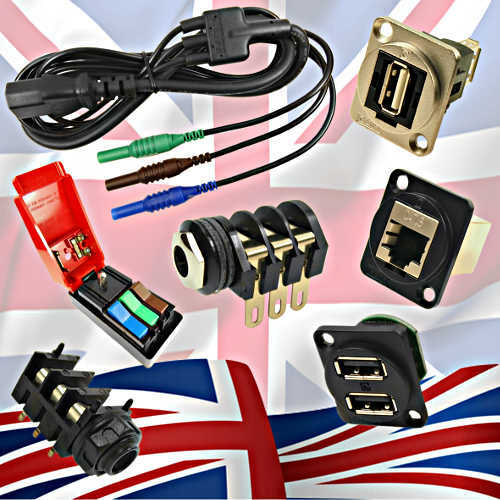 Cliff™ Electronics have added a locking connector to their very successful CliffCon® touchproof plug and socket connectors. The CliffCon®-P range is comprised of a power input plug and socket, a power output plug and socket and an inline cable extension coupler. The ergonomically shaped, locking, power input and output plugs are colourcolor coded. Blue for power-in and greygray for power-out. They feature different keyways to prevent accidental insertion of the incorrect plug. The chassis-mounting sockets are designed to fit into industry-standard, 24mm, XLR-format cut-outs, matching the wide range of standard and feedthrough connectors already available from Cliff™. Blue for power-in and greygray for power-out. The CliffCon®-P input/output coupler may be used to extend cable lengths and features dust caps on both sockets to prevent the ingress of dust or contamination when not in use. The CliffCon®-P range is rated at 20A RMS at 250V AC and may be used in applications including broadcast, auditorium installations, lighting, LED display, signage and video-wall systems and industrial equipment. 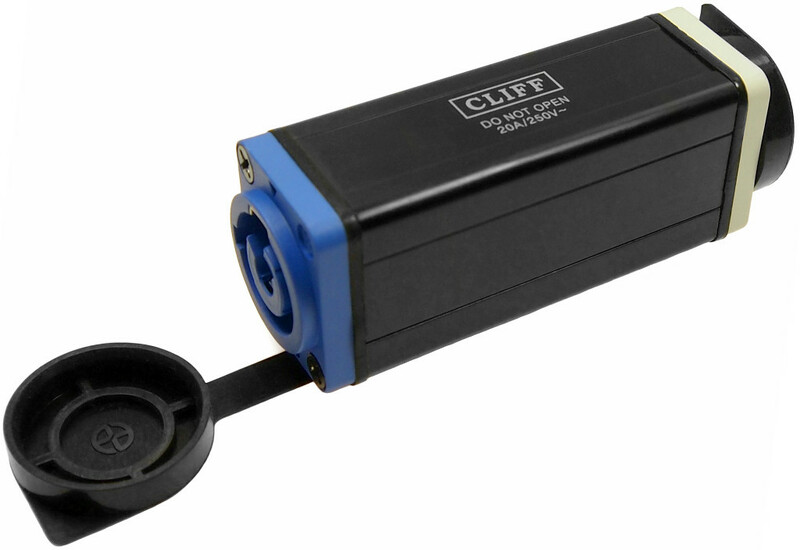 John Hall, Managing Director of Cliff™ Electronics, comments, “Our CliffCon® power connector range is very well established and provides a variety of different, high quality, robust and reliable options. The new CliffCon®-P provides installers of fixed and temporary installations with a simple-to-use, safe, reliable, locking, power connector with the option of extending cable runs for use at different locations. The CliffCon®-P XLR-sized sockets match our wide range of connector types, simplifying panel design.”. Cliff™’s XLR-format connectors take advantage of the standard 24mm panel cut-out widely used in audio and broadcast systems. This is finding increasing popularity in instrumentation, medical and industrial applications due to the format’s flexibility, security and reliability. Blank socket plates are also now available for customers to create custom connector solutions. The Cliff™ feedthrough series of true, feedthrough, data connectors for electrical and electronic instrumentation are perfect when developing custom I/O configurations for wall plates, enclosures, rack panels etc. All fit within a standard XLR panel cut-out and use common, standard cabling for front and back connections with no soldering or screw terminal connections required. 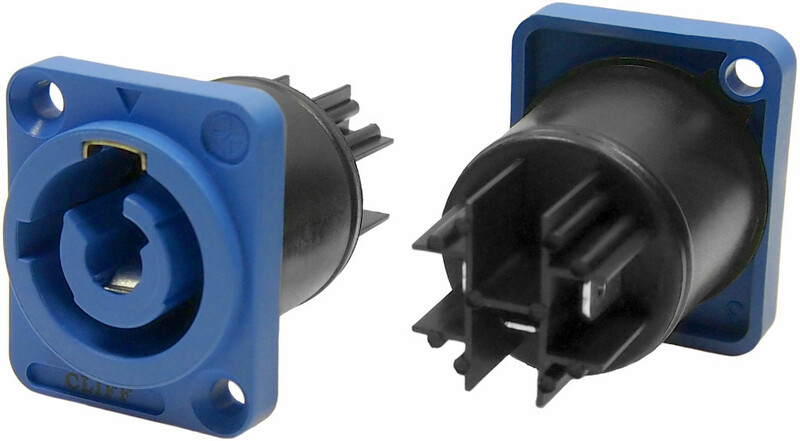 Feedthrough connectors may be mounted from the front or back of a panel and a low rear profile accommodates the tightest behind-the-panel spaces. Pre-assembled 19″ rack panels fitted with a range of feedthrough and standard connectors are available from Cliff™ to simplify end system assembly.